My first thoughts of coffee when I moved to China were ones of longing. It was my first time in Asia, and I arrived with a job at a city university and a stubborn commitment to experiencing the culture in as pure a form as I could—forsaking a few of my favorite comforts from home that threatened to dilute the Chineseness of my life there. First off: no coffee. At least not in my apartment every morning. No, I would save it for a treat in the newly opened café on campus, or even the Starbucks downtown. I would learn to wake up to green tea. After four months of private deprivation, a university administrator sent an emissary to my door with a small, friendly Christmas present: a neatly wrapped bottle of instant Nescafé. My will was broken, and I drank. As soon as I’d washed the bitterness out of my mouth from my first and last cup of instant coffee, I took the hour-long bus ride to the foreign supermarket, in the city’s most upscale shopping mall, and bought a french press. The only bean option was $40-a-pound Lavazza, roasted and ground in Italy. It wasn’t cheap or particularly convenient going back to my morning indulgence, and it certainly wasn’t an exercise in localism, but I found it was possible, and it’s becoming more so every day. The Chinese are not typically lovers of coffee, especially not of fresh roasted or specialty coffee, and certainly not as a morning habit. 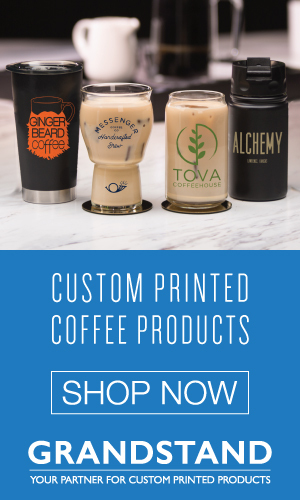 Of the coffee purchased in China’s grocery stores, 98 percent is instant, with the most popular kind being the three-in-one: granulated robusta, powdered creamer, sweetener, and perhaps some other flavoring to cover any remaining coffee taste, all blended in one container. 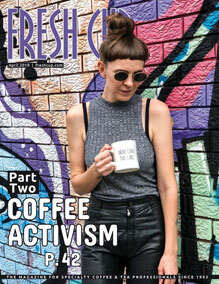 But after more than a decade of corporate pushing and slow evolution of markets and tastes, craft coffee and coffee shop culture have begun to catch on. China has had its own coffee farming industry for more than a century, started when a French missionary to the southern province of Yunnan introduced the crop in the late 1800s, and the industry is now rapidly expanding along with national consumption. The International Coffee Organization estimates China now grows more beans than Kenya and Tanzania combined. But the production, culture, and business of coffee in China are far from being a cohesive subject. The beans grown in Yunnan are all arabica and of middling quality: too good for local consumption, but not good enough for specialty roasters abroad. A large percentage is exported to Germany. Most of what the Chinese drink is imported from Vietnam (the world’s biggest robusta producer), just over the border from Yunnan Province. After the first Starbucks outside the US opened in Tokyo in 1996, Communist China was just a few rounds of international expansion behind, with a store in Beijing in 1999. 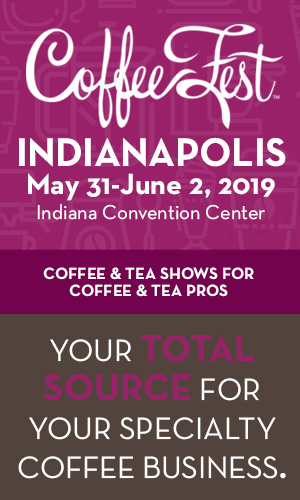 The corporate giant, alternately reviled and revered by coffee drinkers around the world, is a sort of gauge for the status of coffee culture in any market, from national to neighborhood. They won’t go to places that don’t have at least a sprouting taste for craft coffee, but they are shy of pushing into markets with well developed, independent coffee scenes (the very first Starbucks in Italy is being painstakingly planned to open next year). Now, after seventeen years in China, Starbucks controls 60 percent of the café market, and about one and a half new Starbucks open in the country every day. From the International Coffee Organization’s trade statistics, it’s plain to see how the growing taste for coffee in China over the past decade mirrors the same change in Japan in the 1960s and 1970s. Japan’s full embrace of coffee took several decades, but the islands are now the fourth largest coffee consumer in the world. China trails in seventeenth place, and is only so high on the list because of its population, with the average Chinese citizen drinking only five or six cups in a year. Imagine the demand when the figure reaches one cup a week, let alone a cup or two every morning. While the vast majority of Chinese only drink instant coffee and only drink it at home, if at all, a specialty market is slowly taking hold and expanding the market for fresh, high-quality arabica beans. The shops come in two distinct versions: the corporate and the local. The more expensive a cup of American-branded coffee is, the more a status symbol it becomes, and the more people want it. Starbucks is well known for specializing its shops to fit local tastes, which in China translates to eastern-style architecture for some of their stores, and local menu offerings like green tea frappuccinos and red bean scones. 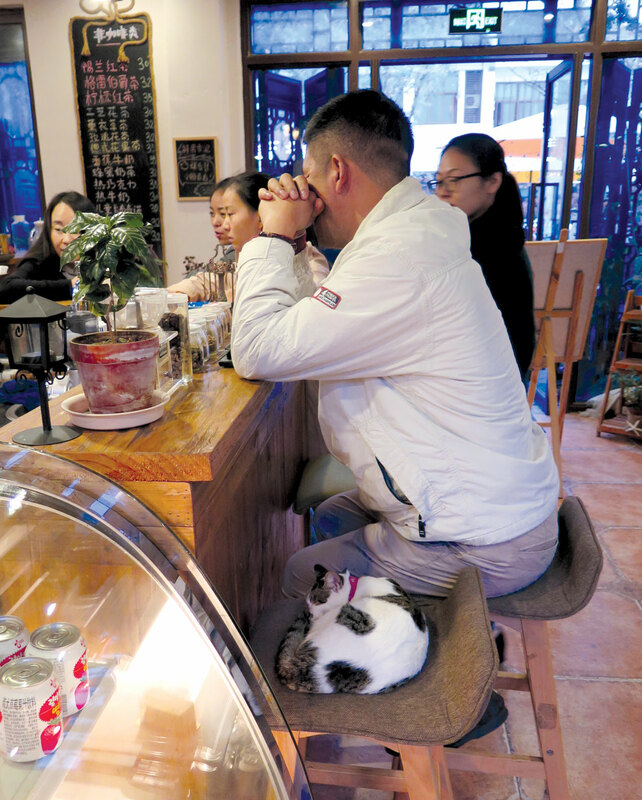 It’s a genius move for the bottom line, and undeniably endearing to the local market, where lots of Chinese people visiting coffee shops don’t want coffee at all. They want tea, sugary drinks, and, most of all, a place to socialize. Still, rather sheepishly one afternoon, soon after moving to a new city in China, I visited my neighborhood’s newest coffee shop during its opening week. Inside, the freshly texturized, cool gray walls and gray stone flooring matched the soupy, smoggy winter sky. Homey Christmas classics played at a just-right volume, despite it being early November. The young customers were comfortably spread out, peering into laptop and cell phone screens alone or in pairs, looking busy. The flat white I ordered was nothing exceptional, but it was everything I had come to hope for from espresso in Asia. 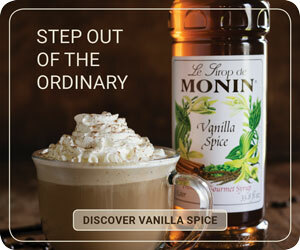 It tasted just like it would in any Starbucks, anywhere in the world. And that, sadly, is exactly where I was: any Starbucks, anywhere in the world. That the brand new store was in the massive, industrial city of Suzhou was a nearly irrelevant detail, despite the tweaked menu. Starbucks plainly states on its website that it is “creating a coffee culture in a traditional tea-drinking society.” The honesty of a statement about such contrived cultural change brings into focus the global effort that goes into drinking Starbucks in China: American branding, Italian espresso machines, Central American and African beans, Chinese baristas. It all seems like proof that globalization has won; China is Westernized. But coffee culture in China doesn’t always mean cultural homogenization. R & B, mostly in English, and offers free Wi-Fi, just like you’d find in most coffee shops around the world, but his menu has no English. This is a rarity for a coffee shop here, where English lettering carries hip cachet. The decor mixes European elegance with the classic, kitschy Chinese modern, including giant teddy bears stationed in the chairs throughout the shop. Max estimates the popularity of coffee in China has doubled in the past five years, and import figures show his estimate could even be a bit conservative. “That’s why so many Starbucks come to China,” he tells me. Max fell in love with coffee after seven years living in Germany. He’s amassed a collection of over 1,000 coffee cups, pots, grinders, and roasters, purchased from all over Europe. And his vision is more about passion than commerce. “I don’t want to have more shops,” he tells me. 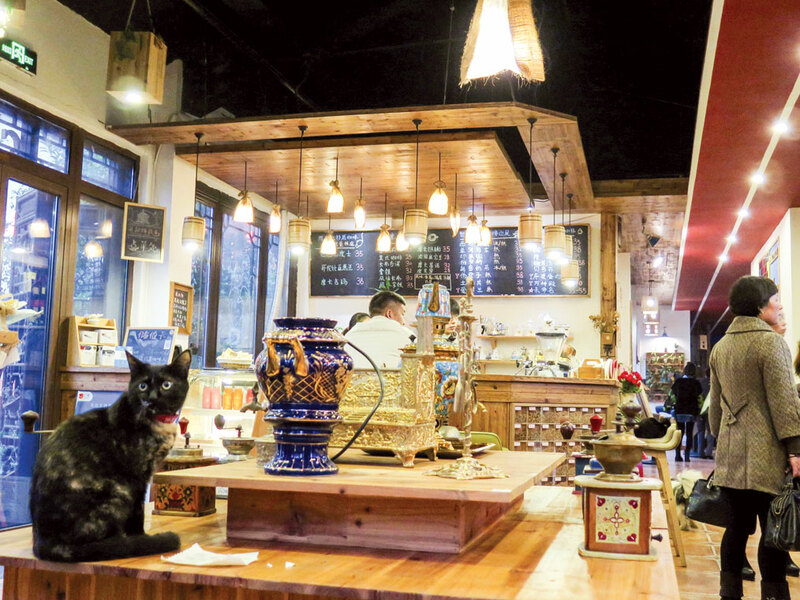 “I just want to open a coffee museum.” Here in a grimy, provincial Chinese city that doesn’t quite yet share his passion, a museum to coffee would harken back to a purer, less commercial kind of globalization. Max says the twenty recipes he’s crafted are the reason for his success. (He’s moved his shop twice now because he ran out of room at the first two, and his happy customers have followed him, despite the neighborhood competition.) While Starbucks injects typically Chinese flavors into the same drinks it sells everywhere in the world, Max concocts complex, intricately layered ones, with flavors such as blue curaçao, peach, mango, and rose, with shots of espresso, and layers of cream and sugar. His drinks are a Chinese take on coffee, not Starbucks’s take on China. A sign outside of 36th Story boldly points customers to Starbucks and Costa. The Chinese menu is a rarity for a product associated with the West. Still, he hasn’t abandoned the foundations for his market. My espresso tasted fresh and perfectly prepared—not bitter, watery, or simply fake, the way coffee in China often ends up when it finds its way to a cup. But in truth, his prices are on par with the competition. The price for a drink at any of the chains, around thirty to thirty-five yuan, converts to five to six US dollars. Coffee still being viewed as an unusual, foreign beverage gives Starbucks a golden opportunity to market itself as an aspirational brand. The more expensive a cup of American-branded coffee is, the more a status symbol it becomes, and the more people want it. 36th Story was the first shop I found that excelled at coffee and felt authentic, both true to its surroundings and dedicated to its craft. 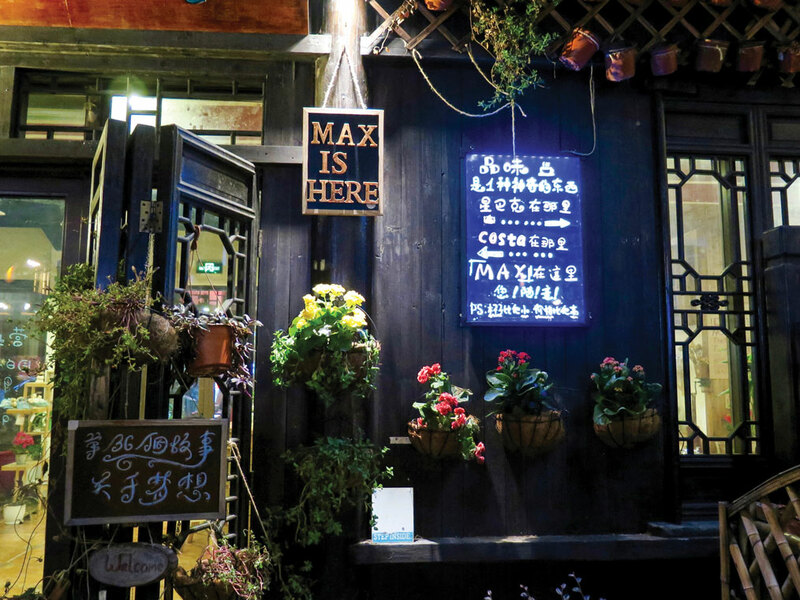 Despite selling mostly coffee in the land of tea, Max’s shop is undeniably Chinese—an authentically local coffee shop, in a country that is only beginning to discover for itself what that means. By creating the culture, as it claims, Starbucks is also making way for independent shops like Max’s to be successful, an economic phenomenon originally noted in the US and dubbed the Starbucks Effect. Independent coffee shops near a Starbucks make more money, not less. With both the foreign corporate brands and the locals charging the same price for a product that tastes about the same to customers who are just developing a taste for coffee, it’s anyone’s guess what the future of coffee in China may look like, but the effects of this country’s tastes will surely be felt throughout the industry. —Ketti Wilhelm is a freelance writer who taught English in Jinan, China.